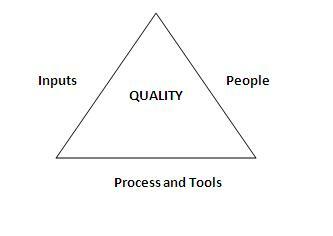 Recently I had a training on Quality Engineering where I was made aware of the Quality Triangle concept. This subject was new to me and I thought it would make a good reading for the people from the software industry who aren’t aware of it or may have different perceptions about it. Here’s how a Quality Triangle looks like. The triangle suggests that there are three important facets that contribute to the quality of any software. These are the People, the Processes and Tools and the Inputs from Management. This is how it works. Consider we have good inputs from product or project management regarding the requirements of a software and we have human resources that are technically skilled, but if we don’t have the right tools and have no processes in place for executing the project, the quality of the end product or the software in this case will be compromised. Similarly, if we have the right processes and required tools in place and have highly equipped people to execute the project but we don’t have the right kind of inputs on the requirements, the quality of the outcome or the software would be hampered. Ideally, all the three, the tools and processes, the people, the inputs, the three sides of a triangle should work in cohesion to produce a software that is of a very high quality. At the end of the day, that is what we desire. You may have a different view on this; please comment on this post so that we all learn from each other.